Clever Bulletin: First ‘Django Unchained’ Trailer is Finally Here!! 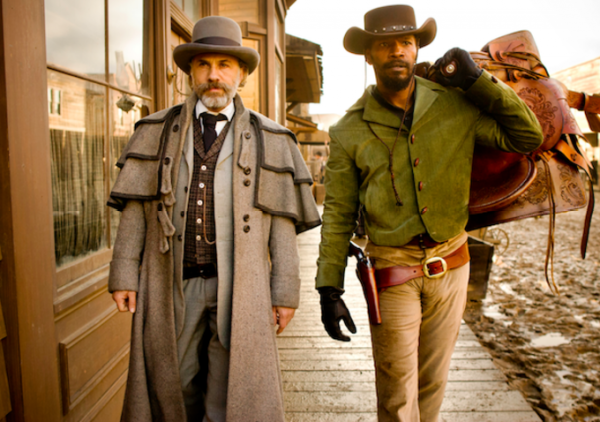 First ‘Django Unchained’ Trailer is Finally Here!! It’s been a long wait, with a lot of anticipation today, but the wait is finally over! The fine folks over at Fandango have shared an exclusive first trailer for Quentin Tarantino’s “Django Unchained.” They’re calling it a teaser trailer, but it’s a full-length trailer to be sure, weighing in at over 2 minutes and 30 seconds. Then again, when you consider that Tarantino’s movies have a tendency to run long, this might just be a teaser trailer after all. We get the full basic plot from this trailer … Django (Jamie Foxx) teams up with bounty hunter Dr. King Schultz (Christoph Waltz), who offers him his freedom and more in exchange for his help. There seems to be plenty of action in these scenes, along with the witty dialogue we’ve come to expect from Tarantino. Leonardo DiCaprio comes in as Calvin Candie, the owner of a famous plantation, who is ready to take on Django and Schultz. Check out the trailer below and see what you think. Will “Django Unchained” live up to the hype? “Django Unchained” opens on December 25th, 2012. Official Synopsis: Set in the South two years before the Civil War, “Django Unchained” stars Academy Award®-winner Jamie Foxx as Django, a slave whose brutal history with his former owners lands him face-to-face with German-born bounty hunter Dr. King Schultz (Academy Award®-winner Christoph Waltz). Schultz is on the trail of the murderous Brittle brothers, and only Django can lead him to his bounty. The unorthodox Schultz acquires Django with a promise to free him upon the capture of the Brittles – dead or alive. Success leads Schultz to free Django, though the two men choose not to go their separate ways. Instead, Schultz seeks out the South’s most wanted criminals with Django by his side. Honing vital hunting skills, Django remains focused on one goal: finding and rescuing Broomhilda (Kerry Washington), the wife he lost to the slave trade long ago. Written and directed by Academy Award®-winner Quentin Tarantino, “Django Unchained” is produced by Stacey Sher, Reginald Hudlin and Pilar Savone. The executive producers are Harvey and Bob Weinstein, Michael Shamberg, Shannon McIntosh, and James Skotchdopole. “Django Unchained’ will be released in the U.S. by The Weinstein Company on December 25, 2012, and internationally by Sony Pictures.